Perfectly poised in a pink and black ensemble, Anna Berenz walked into the room. One might not expect that the 19 year old teaches a class at a prison or that the girl with lace skirt and pink umbrella shoots guns competitively. "I love guns," she said, rattling off her favorites: a .10-caliber shotgun, a Ruger .45-caliber pistol and an AR-15 in the high-powered category. Berenz has been learning how to handle a gun since she was just 3 years old, no doubt influenced by her father, who she describes as a "huge gun lover." 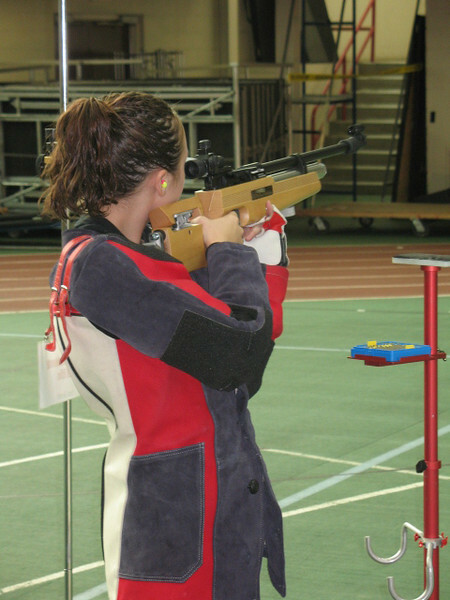 During high school, Berenz shot on an area rifle team. At one time, she was ranked third in the state of Illinois in her age group. If it were not for a move by her family, she had the potential to go on to Junior Olympics. Berenz practiced inside-yes, inside-her family's house, using targets with concrete backing, or at a nearby shooting range. She said she likes the sport because of the individual performance aspect. "There is no blaming it on anyone else. It's you and the gun. You either hit the target or you don't," she said. Her work-hard approach applies to her time at Indiana State University as well. Berenz attends ISU on a Mistos Presidential Scholarship, the most prestigious academic award given by the university. Originally from Elizabeth City, N.C., Berenz is a junior studying psychology. An enigma of sorts herself, Berenz hopes to work as a head psychologist for a prison one day. "I want to help people. I like how the mind works and everything that goes with it," she said, adding that the television show "Law and Order: Special Victims Unit" sparked her interest in the field. To gain real-life experience, Berenz interns at the Federal Correctional Institute in Terre Haute. "Driving up to the prison the first time was the scariest part," said Berenz, describing a solemn brick building surrounded by barbed wire fences reaching 20 feet high, a scene she said reminded her of concentration camp she had visited in Dachau, Germany. But Berenz quickly realized she enjoyed her time at the prison, where she teaches a life skills class once a month for an average of 40 attendees. "They truly want to make a difference in their lives. They're really appreciative," said Berenz. Life in a prison setting is a "completely different world," said Berenz. She added that she is thankful for the opportunity to understand people she might not have the chance to interact with otherwise. "Not many people my age get to work at a prison and have their own class. It's just a great experience." The internship didn't just fall into her lap, however; Berenz went after it. After talking with a friend who interned at the prison, Berenz met with the supervisor there and discovered an opportunity to teach. "She went to get an internship on her own and told me after she was already in the process. The amount of experience will be far above what most students have since she started so early," said Jennifer Schriver, professor of psychology at Indiana State University. Describing Berenz as "super bright" and "ambitious," Schriver said Berenz has always had a good sense of where she's going, even from her freshman year. "Many first-year students are just trying to keep their head above water. Even when she was in my freshman class, she has always been really just above the curve," said Schriver. Berenz describes Schriver as a mentor. Schriver has background in forensic psychology, the same field of interest as Berenz. "I really like the psychology department and the relationships I've built there," said Berenz. Berenz noted several unique benefits of studying at ISU. She described taking a class taught by the dean of the College of Arts and Science. "Not many people get the chance to take a class with the dean of their college. That was pretty cool." She added an appreciation for the special effort President Bradley makes to know students. "The president knows me on a first-name basis. I've had dinner at his house. It's a completely different student life than most students get to experience." One might not expect that the 19 year old teaches a class at a prison or that the girl with lace skirt and pink umbrella shoots guns competitively.